It took me at least six months for my skin to get lighter. I am not talking about whitening and all the stuff. I am lighter because I wear long sleeve during the brutally cold season here in Western New York. My skin is covered and not expose to the sun. Yesterday was so warm but a little breezy. The temperature went up to 80 Fahrenheit degrees. It feels like summer. I am sure that all the Western New Yorker are enjoying the warm day. My family took advantage of the warm weather. All of us stayed outside and did outdoor stuff. I went to the pond. The water looks so clear and clean. You might jump into the water but it is freezing. I even touch the water and indeed very cold. I am enjoying the sun and gets tan right away. My natural tan shows. I cannot wait when our pool is open and the water is warm. I cannot wait to swim and spend time with my family in our pool. It is not officially summer yet but I am tan already. My natural skin color shows. I do not burn yet I still need to put some sunblock lotion especially my face and my arms and body. 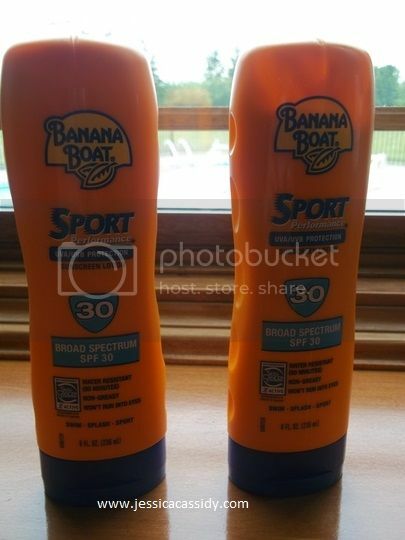 I am glad that our local pharmacy is having a sale on Banana Boat sunblock lotion. You get one if you buy one. It cost almost $11 but I do not mind the prize. We need to apply sunblock on our body not just mine but my kids as well. It will protect us from the sun rays especially from swimming or playing outside. How about you? Do you apply sunblock lotion on your body too? What is your favorite brand of sunblock lotion? I plan to wait for my birthday which is about two months to cut my long hair. I just cannot wait for two months. I decided to have my hair cut two days ago. I took a shower and drove to a hair saloon called Fantastic Sam. I also have a coupon for the saloon so why not use it, right? It is my first time to have a hair cut in this saloon. It is also close to Big Lots store which I need to buy snacks for the little girl for school. There were two women smoking outside. It makes me uncomfortable walking to the saloon. I just cannot stand the smell of cigarette. They thought that I am going to have my nails done. They both stand up when they see me walking straight to the saloon. I hold my breath until I am inside the saloon. I told them that I will have a hair cut. I want to donate my hair to Locks of Love. I am not sure if it is enough to donate. The hairdresser measure my hair and she is it is way too long to donate. I am very happy for that. The hairdresser sounds so happy that I will donate my hair. She said you go girl for donating your hair. She asks me if it is my original hair color. I just smiled at her and said yes, this is my original hair color. She also told me that I have a beautiful thick hair. She asks me how I take care of my hair. I just said I use regular shampoo. The hairdresser is very pretty, in her mid-20. I really like her long curly hair. I always like curly hair. She has a natural curly hair. She said anytime she wants to trade her hair with mine. I also told her that I will turn 40 years old. She said no way you look too young for being 40 years old. I think it is just a number. It is how the way you take care of yourself. She cut my hair right on the shoulder after cutting at least 10” off my long hair. I told her that you can cut it very short. She cut my hair all the way from chin. I also ask her if she could trim my bangs. The saloon is not busy which I am thankful for. I do like my new short hair. She gives me a bag for my hair that I will donate. I ask her if she has a form available for me to sign. She said they do not have any form which is fine with me. I was about to pay for my haircut. I was surprise that she said that I am all set. 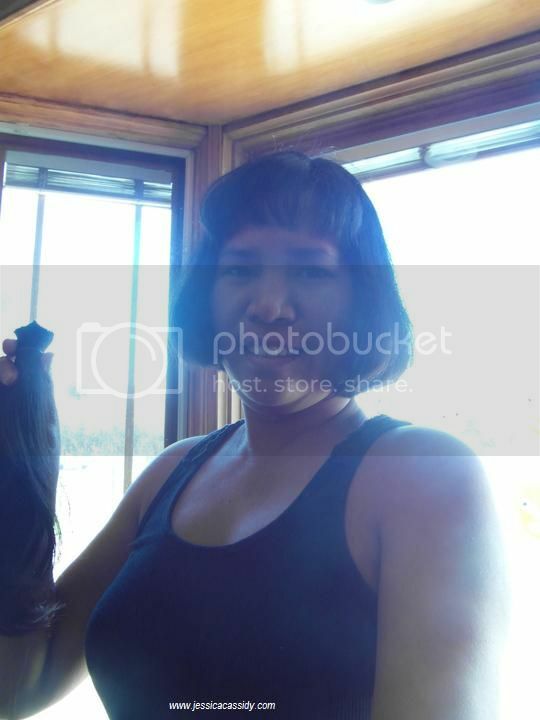 I did not know that it is free once you donate your hair to Locks of Love. I ask her are you serious that is free? She said yes, it is free. I gave her a $10 tip for cutting my hair. By the way, Locks of Love is an organization where you can donate your hair for the cancer kids. It is the best thing that I did for my hair. I am very proud of what I did. My hair grows fast so I do not worry about having short hair. I promise myself that I will donate my hair every October. It is a month of breast cancer awareness too. My eldest sister is a breast cancer as well. The next day, I went to the library. I print a form to use when sending my hair. The Locks of Love office is in Florida. I mailed it through priority mail. I hope that I can make a little girl happy with my donated hair. I have a long hair and it is almost touch my bra line. I plan to cut my hair very short like below my chain. I will not miss my long hair? Why? It is because my hair grows faster. I plan to donate my hair to locks of love. I am not sure if it is long enough to donate my hair. I read their Website. It says that the hair’s length should be between 10-12”. I am not sure if my hair is long enough. I could keep it long enough until my 40th birthday. I will cut it after my birthday. My husband likes my hair short. I do not mind cutting it short for him. I love having a long hair. It is easy to take care honestly than having a short hair. What do you think ladies? Is my hair long enough to donate it to locks of love? I am linking this entry to the 17th day of August blog photo challenge.